Upper: Dual layered mesh, internal sleeve, plastic heel clip. Weight: 313 gms/11.04 Oz for a half pair of US 10.5. The Adidas Sonic Boost is first of the three 2013 shoes featuring the innovative 'Boost' foam. The Sonic does not spectacularly impress in any one area, but instead delivers all around competence with little to fault for. Pity that the shoe was not a worldwide release - it had such potential. The Sonic Boost 2 then, maybe? In footwear industry parlance, Adidas Sonic Boost is what is called a ‘takedown’ or part of a ‘tiering strategy’. Before the word ‘take-down’ conjures up images of Herculean bodybuilders besting each other on a floodlit ring, let us explain. Let’s say there exists a shoe which represents the pinnacle or statement level of a product line or a technology, but comes with a credit-score-busting price tag. So the brand introduces a shoe or a product line which is financially more affable while featuring a toned, or take-down level of the signature technology or component. A good analogy would be the difference between the premium iPhone 5S and less expensive 5C. The original 2013 Energy Boost released to widespread adoption by runners and recreational users alike, but at $160, it was expensive. Given that circumstance, things made perfect sense when Adidas followed it up with release of the Sonic Boost in August 2013. 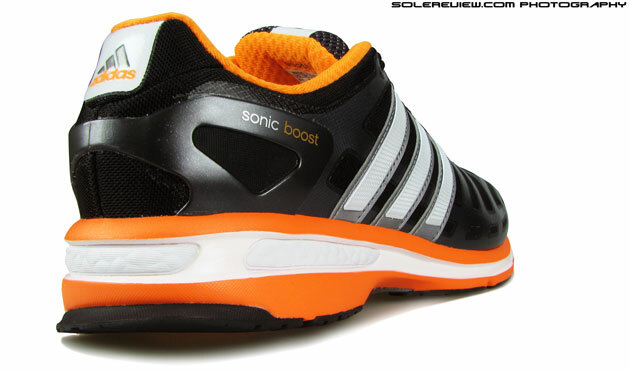 The $100 Sonic showcased the Boost technology in a more conservative form, and at a full sixty below the Energy Boost. For reasons best known to mandarins at Herzogenaurch, the Sonic Boost doesn’t seem to have landed Stateside, Canada or even Australia. Is Adidas waiting for Sonic Boost 2 to launch? Not sure, but the coming months might hold a clue. Whatever the reason, it’s a pity that the Sonic Boost is not a worldwide launch. Sometimes, footwear excellence is measured not by instances of in-your-face superiority, but rather the uniform tedium of competence. In other words, if there is little wrong with a shoe, then it must be really good. The Sonic Boost falls in that category. The shoe does not come across as spectacular in any one area, but when seen as a complete package, the Sonic delivers on multiple fronts. Where do we begin? The upper is a good starting point. 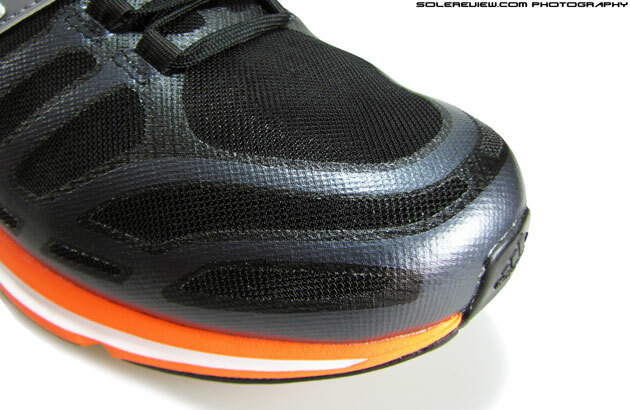 The Sonic Boost eschews the use of Energy Boost’s ‘Techfit’ upper and instead uses a dual layered mesh set-up. 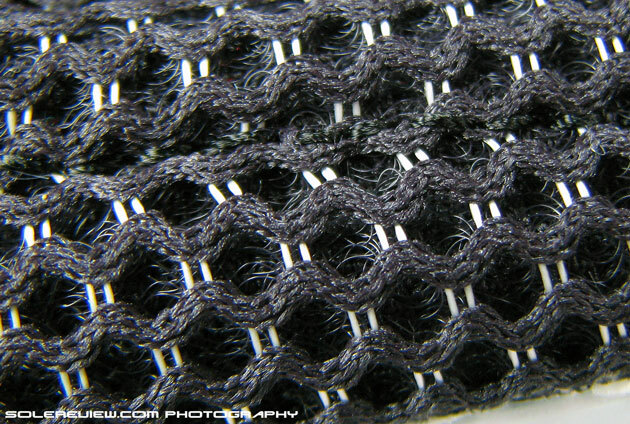 The layer on top is a thin, near see-thru mesh which is coated with fused overlays – very thin overlays which prop up the upper without the burden of weight or bulk. 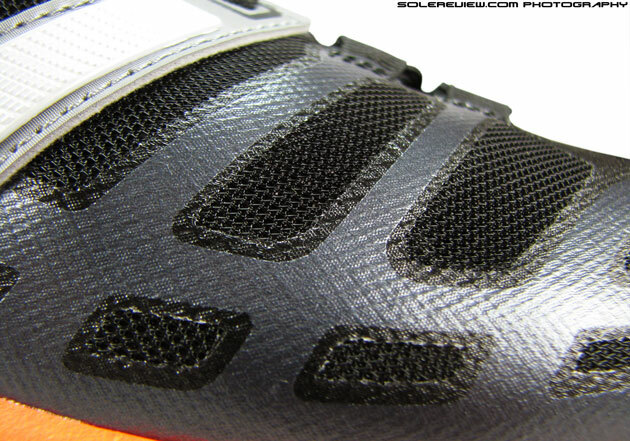 The lower layer is thicker, sandwiching a thin layer of foam and enveloping the foot in comfort. This two layer construction works well in tandem, but has a minor trade-off in form of the upper running slightly warm. The air-mesh tongue is a chunky, foam padded type and comes thoughtfully attached to the upper, forming an inner sleeve with the upper lining. There’s a pearlized band of fused TPU stripe running down its length, which not only adds visual allure, but works functionally to decrease the top-down lacing pressure. The tongue is slightly long though, and tends to ride up the foot. The ends are soft and padded to touch, and it does not result in any discomfort – so no harm done. The mid-foot is a simple affair. 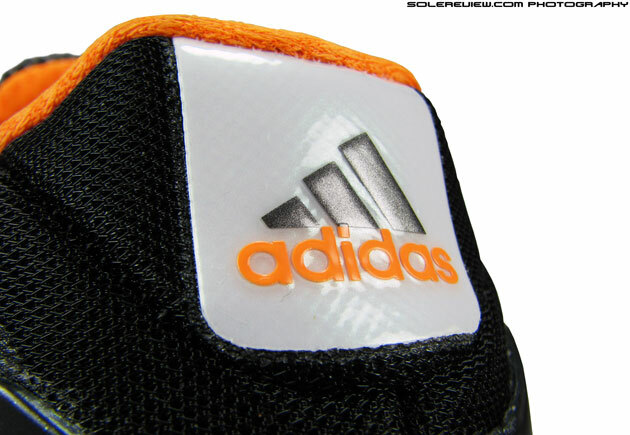 Three trademark Adidas stripes climb up the sides and form part of the lacing system. 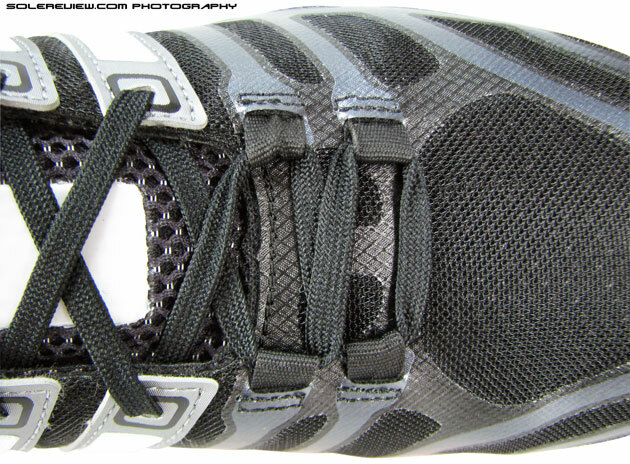 The flat laces pass through them, making the mid-section snug but far from cramped. There’s a certain fit uniformity in the Sonic Boost which will find favor with most runners. The front and mid-foot have this perfect consistency of fit – neither too tight nor too roomy. Given that there’s no ‘Tech-fit’ fabric used here, the upper does not have this compression fit which is characteristic of the Energy Boost. But what the Sonic Boost lacks in material, it makes up in construction. The lacing is a deviation from regular Adidas norms, extending right till the front and stopping just short of the toe base. Two rows of lacing is given special treatment upfront, and lacing passes through two speed loops instead of regular eyelets. 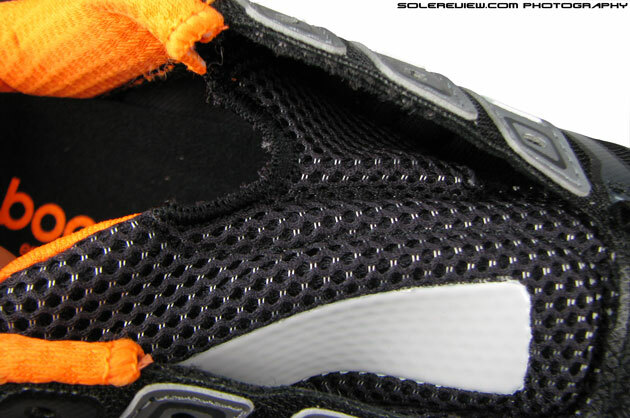 The lacing coverage is short, so there’s no undue pressure either on top nor on the sides. There’s a uniformity of fit and feel right from the toes to where the collar begins, and as a bonus there’s some open space ahead and above the toes. The Sonic Boost fits true to size (be sure to up half a size for conversion difference vs US brands), but in way which comes across as far more relaxed than the Energy Boost 2. 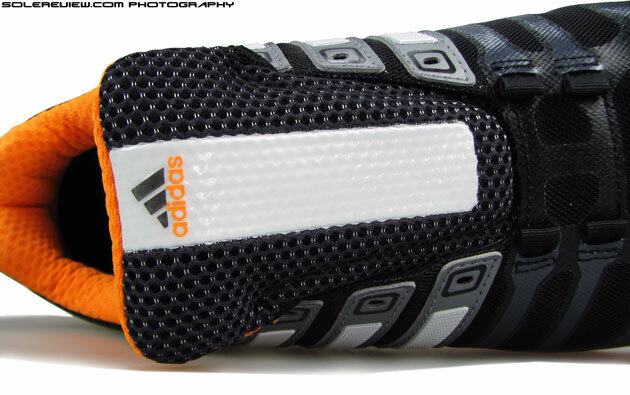 The collar could do with some improvement in the succeeding version of Sonic Boost, if Adidas has plans to release it. The collar is generously filled in with foam, but the walls are low so the grip isn’t all that assuring. The plastic heel counter, which adds support to the area, also tends to splay the heel outwards, leading to a feeling of open-ness on the sides. But other than that, the Sonic upper does its job well with good construction fundamentals applied overall. Most components come well together to produce a comfortable fit and feel; no errant parts digging or chaffing the foot. 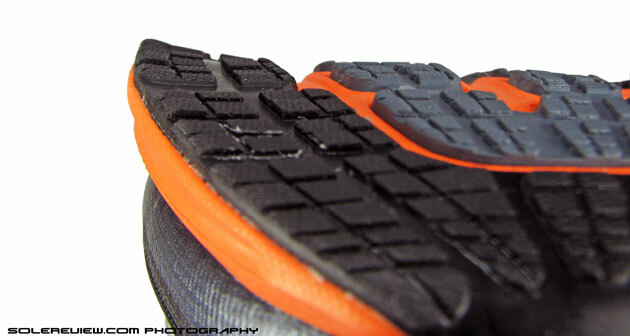 Low visibility running isn’t the Sonic Boost’s forte, as seen from complete absence of reflective elements on the shoe. 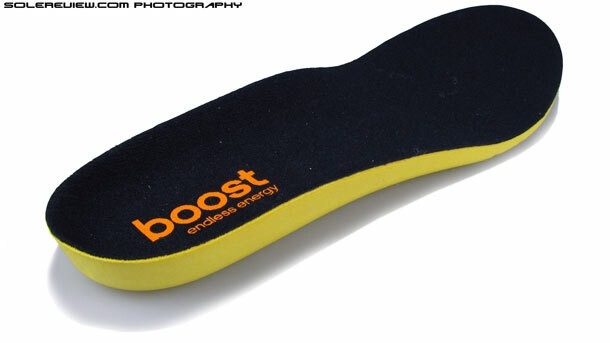 It would have been nice to see a Energy Boost 2 type logo treatment on the heel, which illuminates under light. 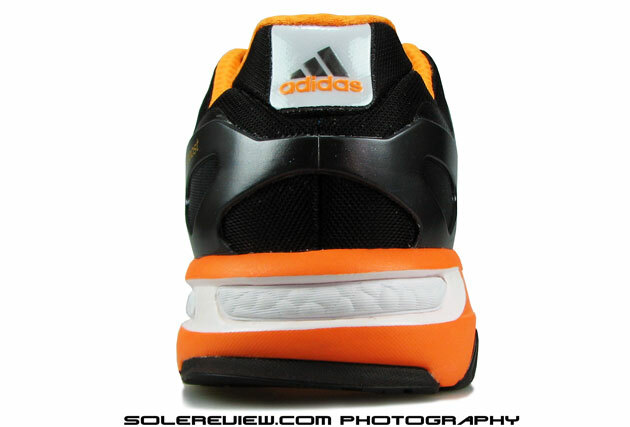 The heel tab logo on the Sonic Boost looks great, pearlized and all that, but is not reflective. That you can’t judge a book by its cover is a popular saying, and it couldn’t be truer for the Sonic Boost. Outward appearances show liberal use of traditional EVA (Ethylene Vinyl Acetate) foam in its midsole, and on closer inspection the material is actually very firm. But then, the midsole isn’t all EVA. The shoe features pop-in Boost foam units in heel and forefoot, and what a difference to the ride it makes. 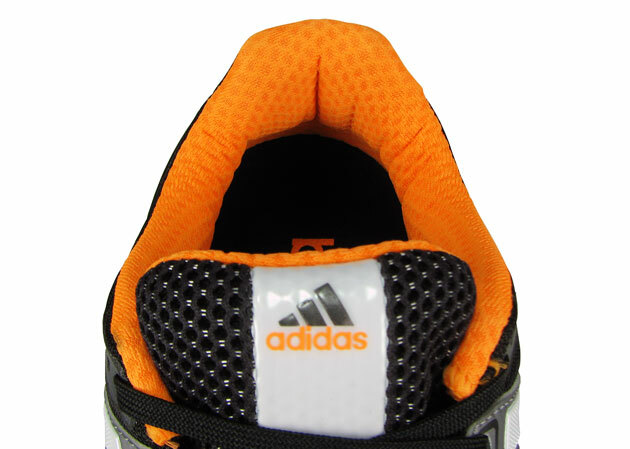 Infinergy foam, which forms the core of the Adidas Boost technology, is soft and responsive at the same time. 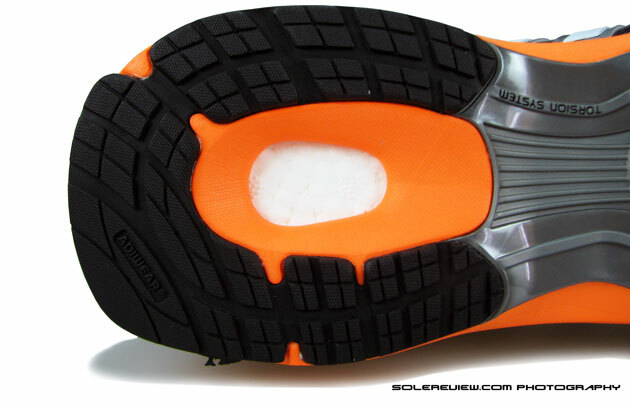 Its performance is vastly superior to traditional EVA foam (read our Energy Boost 2 review for a detailed explanation) and the cushioning is unlikely to bottom out over time. The cushioned ride belies Sonic Boost’s external demeanor, with generous padding both under heel and in the forefoot. Like the Energy Boost 2, a circular cutout under the contoured sockliner brings the Boost material closer to the foot, producing a rear-foot strike which feels extremely well cushioned. 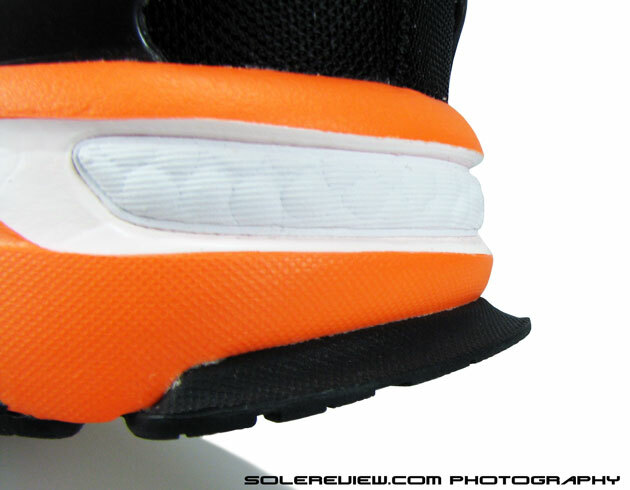 Mid-foot area is standard EVA foam seen on the midsole wall, but the firmness isn’t felt much as it is lined over with a few millimetres of EVA in form of the molded insole on top. Move over to the forefoot, and the Boost insert lies below the cloth strobel. There isn’t a cutout like in the back, but cushioning is adequately responsive – this makes the Sonic Boost work well for forefoot strikers as it does for heel and rear-foot pounders. The firm midsole encasing does a nifty job of delivering stability in the Sonic Boost. 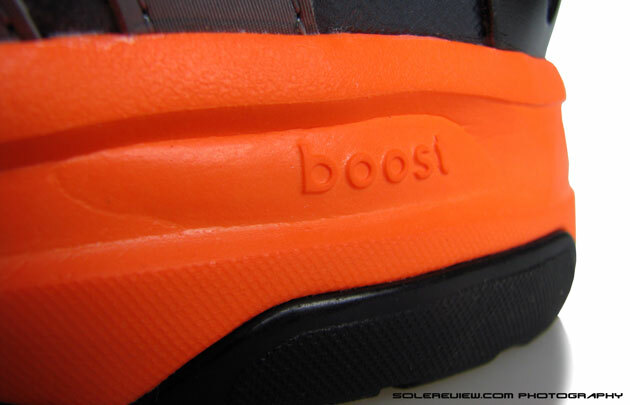 The entire midsole perimeter is injected molded EVA with Boost side ‘windows’ in the heel. This serves as firm boundary of sorts on the side, preventing any excessive lean during runs. It also aids the centre of gravity as most of the cushioning compression happens along the toe-to-heel centre, where the Boost units are inserted. Some people might notice a relative stiffness in the forefoot, but on the flipside the firmness helps in quicker toe-offs. For a shoe which looks like the Sonic, it is surprisingly lightweight. For a US 10.5, it weighs 11.04 oz (313 gms), pipping comparable shoes like the Nike Air Pegasus 31 and even the 2014 Energy Boost 2. This squarely puts the Sonic Boost in the league of lightweight neutral runners, except that it isn’t available everywhere. The placement, material and design of the Sonic Boost outsole is very similar to the more expensive Energy Boost 2, so the net outcome is more or less unchanged. The small lug design grips well and appears durable enough, with the extended outsole ‘lip’ helping heel strikers transition during landings. 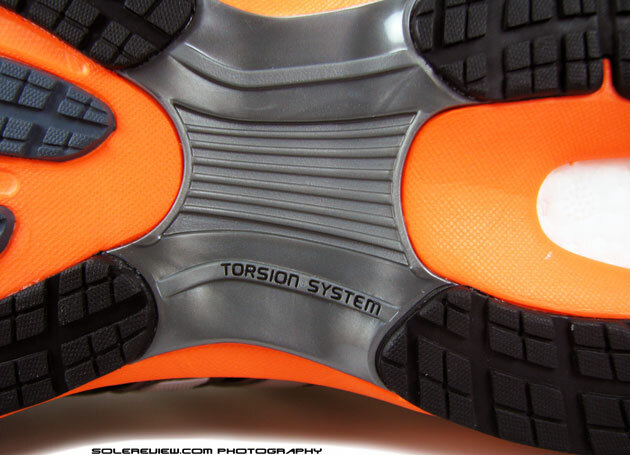 The mid-foot shank is standard ‘Torsion’ fare, a plastic component hugging the midsection of outsole. There’s a rubber wall on the inner side of the rear midsole – it was hard to say whether it actually helped in stability (with the midsole being so firm), but it adds a touch of aesthetic contrast. 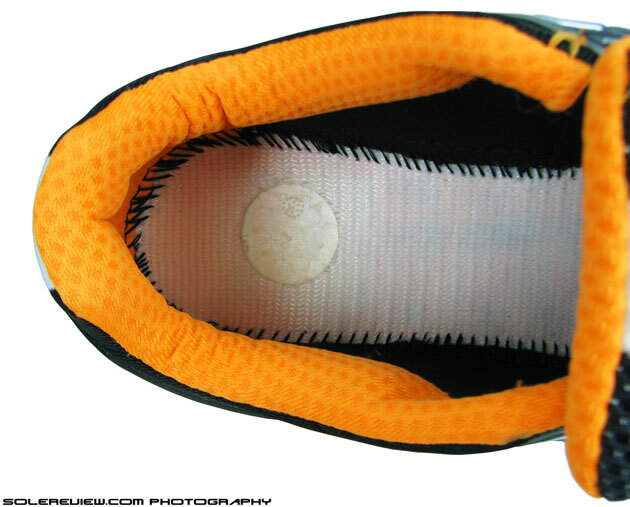 The forefoot outsole when seen flat from the front, curves in towards the center in a corner-up position. This seems to be a manufacturing oversight instead of being design led, and this will lead to some early wear on the medial outsole. But then, very few shoes are perfect, and nitpicking will invariably lead to unfavorable discoveries. Look past a couple of Sonic Boost’s pardonable flaws, and what you’ll get is an extremely well behaved neutral running shoe. The upper fits great throughout, the cushioning is a surprising revelation and somehow the Sonic Boost manages to throw in a lot of stability while being lightweight. These are still early days for the Boost platform, but the Sonic Boost gives everyone a glimpse of how the future might look in Adidas running. From what we’ve experienced so far, the future surely appears bright. Now Adidas, let’s have the Sonic Boost 2 (if planned) as a worldwide release, ok? Checked out the Sonic Boost and the Energy Boost shoes at the stores , and felt that the sonic boost was the better shoe if one in running on a road etc.. your views pls. Also how would the Sonic boost compare against a puma faas 1000? Both the Sonic Boost and Energy Boost are great shoes. The Sonic is a more easygoing shoe of the two, with a more relaxed fit and feel. So no harm in buying the much cheaper Sonic Boost, it will do well for your daily road-running needs. Haven’t tested the Faas 1000, so can’t comment on how the Sonic stacks up against it, sorry! I was curious about the Boost technology and tested the Energy, the SG6 and the Sonic Boost at my local store, eager to replace one of my two deceased Nike Zoom Elites during half marathon training. 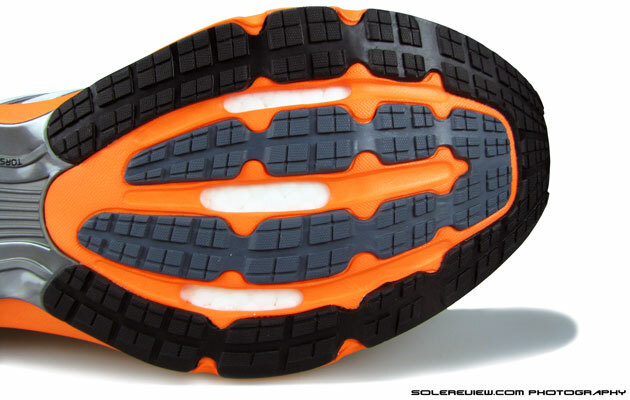 My impressions were good, and I bought the Sonic: a good combination of cushioning, nice fit, good looks and price. But just after the first 5K the plastic heel clip unstuck from the shoe. Since it can be an isolated case, I used the warranty and asked for a new pair. I’ll put some miles in these new Sonics and contribute here with some impressions from long term use. Last but not least, you guys make super detailed reviews with nice photos, among the best i’ve read, congratulations. Thank you! Look forward to hearing about your experience with the Sonic Boost. Sorry to hear that the heel clip came off – that shouldn’t happen, at least so quickly. Regarding durability, my pair of sonics currently are well north of 1000km (~620mi) and feel pretty much as they did the day i bought them. 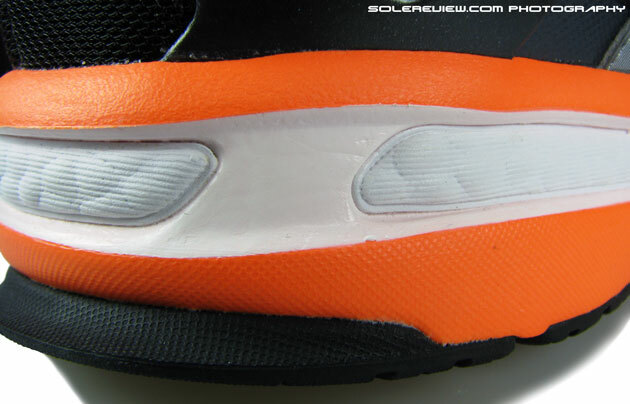 The outsole in the forefoot is fairly worn and some of the eva next to the harder rubber is also starting to wear as the outsole gets thinnner, but they still feel plenty protective. Thank you for sharing your experience with the Sonic Boost, it is helpful for us and other readers to know. It just validates that Boost does what it claims to be, unchanged in cushioning even after putting so many miles on them – even though the outsole is well past its prime. thanks for shared impressive review of sonic boots.! how about adidas climacool sonic boost compare with this? Sorry, can’t say because haven’t tested the Climacools yet.